Charge your USB devices and power your electrical appliances at the same time, in the same socket! This Korjo 2 Port USB & Power Adapter (Australia & UK) combines a standard wall socket plug and 2 x USB ports, allowing you to charge and connect multiple devices at once. 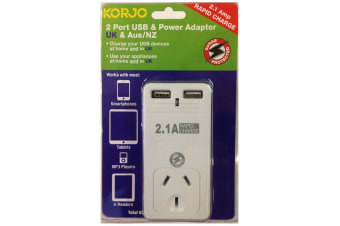 Use in Australia or the UK, this Power Adapter is ideal for the home or when travelling.